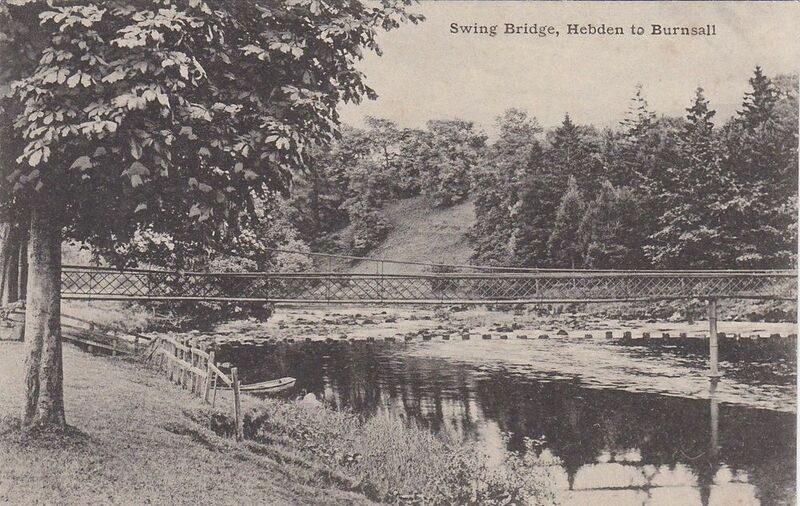 This is a Grimshawe's Upper Wharfedale series postcard of Hebden Suspension bridge, probably photographed in the mid-1900s. It was taken from the upstream true right bank. The bridge was built by the Hebden blacksmith William Bell in 1885 largely from materials recycled from the lead mines. Idiosyncratically for a suspension bridge, it had a central support. This was damaged in a flood in 1937, and the bridge was raised and the support removed. The base of the support can still be seen when river levels are low. The stepping stones downstream of the bridge were restored in 2001 by the Yorkshire Dales National Park as a Millennium project. Click the image to see a larger version.